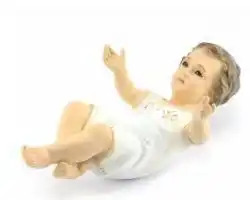 Jesus child in dreams. Symbolic meaning and interpretation. What does it mean to dream of seeing Jesus who is a small child on the cross? Why can we dream to see the statue of the Madonna with baby Jesus? What does it mean to buy a small statue with a baby Jesus or find a necklace with the drawing of Christ? What is the meaning of dreams in which we see God becoming a child and coming towards us to clasp our hands? How many of you have dreamed of talking with baby Jesus or have even dreamed of being as small as Jesus Christ? What does it mean to dream of invoking Jesus or screaming against his statue? Savior, Redeemer, Messiah, Son of God, the Son of Man. Jesus can be called with many names. What does it mean to dream of being with our mother, father, son, nephew, sister, brother, cousin, brother-in-law, husband, wife, boyfriend, son, friend or work colleague and together we see the Madonna with Jesus Christ descending a very bright cloud? What does it mean to dream of the child Jesus who suffers and weeps on the cross with tears of blood flowing down his face? What does it mean to dream of killing Jesus who wants to hug us instead? What numbers is it possible to pull out of the Neapolitan grimace if we want to play the lottery when we dream of being with Jesus Christ, to look for a little bit of money by following what the guide and the dream book says? "This night I dreamed of praying towards the statue of a tiny Jesus. Last night I dreamed of eating a consecrated host together with the son of God. Last night I dreamed of hearing my name from Jesus. The other night I remember to have killed the baby Jesus". Today we see to bring out the meaning of those dreams in which we have the honor of meeting Christ and speaking with him, of interacting with his spirit. Many people say they have caressed his face or his cloak, having eaten with him or even prayed with him in his home or in a church or in heaven. Who knows how many times you have dreamed of the figure of Jesus in your dreams. Certainly analyzing this kind of dreams is not easy also because you have to start from the concept of religion and the value that every dreamer, in his life, gives to religion. In fact very often very religious people can dream of seeing Our Lady, Jesus, various saints. We must therefore try to understand if the dreamer is a very religious person or not. Obviously if we are faced with an individual who frequently attends Churches, praying a lot and also following the word of the Gospel, then the word of God, it is very easy for this person to make dreams of this kind, sometimes or even often. So we try to exclude very religious men and women from this kind of dreams by saying that the presence of Jesus in their dream world simply represents their need to follow the dogmas of the Catholic or Christian religion. If, on the other hand, a person who does not have a particular attitude towards religion, dreams sometimes or rarely this Christian symbol, then it is very likely that a much deeper meaning can be hidden and must not be ignored. First we start by saying that every religious symbol that appears in a dream often symbolizes the dreamer's strong need to seek help to solve a particular situation he is facing in his life. A moment of difficulty, an event that disturbs our existence and which can not easily be solved by the intervention of some people. In short, an ineluctable and not easily resolvable event that can only be arranged with divine intervention. So when we dream of Jesus we must think that we are in a fairly complex phase of our earthly existence in which we seek an alternative solution to a problem that can hardly be solved. Hope, faith, charity. Precisely from these three concepts, from these three words we can start to interpret such religious dreams and symbols. So when we see the Son of God in our dreams, then we still have a little or big hope in our hearts to solve a situation that is bothering us. Our faith allows us to hope but this faith is not only what we have and we feel towards God. Practically we are living a very complicated moment but we have an excellent inner strength that allows us to continue, not give up, to go forward hoping for resolution of all the problems. In essence, Jesus in a dream has a great meaning and his symbolism tells us to trust, to have faith and to be able to hope to go forward as it is possible to rely on a large internal energy charge. When everything goes wrong but we do not lose hope then the situation can change and move from a negative state to a positive state, reversing the situation. But we have always specified that every detail of our dreams is very important in order not to get out of the tracks and then make mistakes. The presence of Jesus must be evaluated in the whole context of the dream. We must remember, when we wake up, the objects we saw and used, the people who were with us, the places we were in and the feelings and emotions we experienced. Often when we dream of religious figures like Jesus or Our Lady, we experience a feeling of great amazement, fear, well-being, inner serenity precisely because we are faced with very positive symbols for those who believe in God. Those who believe in God and dream of praying a Holy, the Holy Spirit, Our Lady, Jesus, must always be able to draw from the dream a very positive meaning, a bearer of balance, serenity, tranquility, optimism. But very strange things can happen in our dream world. For example, Jesus can be represented on the cross as an adult man or as a child. What difference do we find between these two religious representations? The adult man on the cross who suffers for our sins, we are probably ourselves that we are simply suffering for a given situation in life. The child, however, is a symbol even stronger and more full of meaning because it represents a part of our character. That child, in fact, is the symbol of our childish spirit that is dying, perhaps because the responsibilities of life are assailing us. If that child cries, is very sad or loses blood, then the dreamer has completely lost his childish spirit. Some people say they saw the statue of the Child Jesus or a painting in which he appears together with the Madonna, who wept tears of blood. The blood should not make us scare because it is the symbol of a moment in our life where we are very tired and therefore we are without psychophysical energies. The blood that flows along the face of Jesus is therefore a symbol of little faith, the symbol of a hope that fades because of our mental exhaustion. But fortunately Jesus can also smile and not just cry with tears of blood or be sad. When we dream of Jesus smiling, then we can well hope to be able to solve a problem very soon because our inner strength is truly exceptional and unshakable. Here is a true meaning of this religious figure. Jesus symbolizes our inner strength because we do not forget that within our soul, in its depth, we find the divine light, that light that puts us in connection with the universe and with God. Other people tell to caress his face, to dry his sweat or his tears. These dreamlike attitudes represent the desire to find relief in a complicated moment of our life and this relief could come from our faith but also from a person who appears at our side in dreams. In fact, we must never forget the people who are with us, maybe people who pray with us. Unfortunately it can also happen to want to kill and injure baby Jesus. Why can we do this? Why can we feel hatred of this religious figure? Killing Jesus simply means killing the faith and the hope we have within us. We conclude this topic by talking about those dreams in which Our Lady holds her baby in her arms. This dream scene appears very often. Most probably the maternal figure and therefore the Madonna, represents the relationship we have with our mother or with another woman who is part of our family. A scene full of meaning but of a very positive meaning, symbol of a very strong union and therefore of great love.